Track X Cemetery is sited in what was once No Man’s Land prior to 31st July 1917, the opening day of the Third Battle of Ypres. 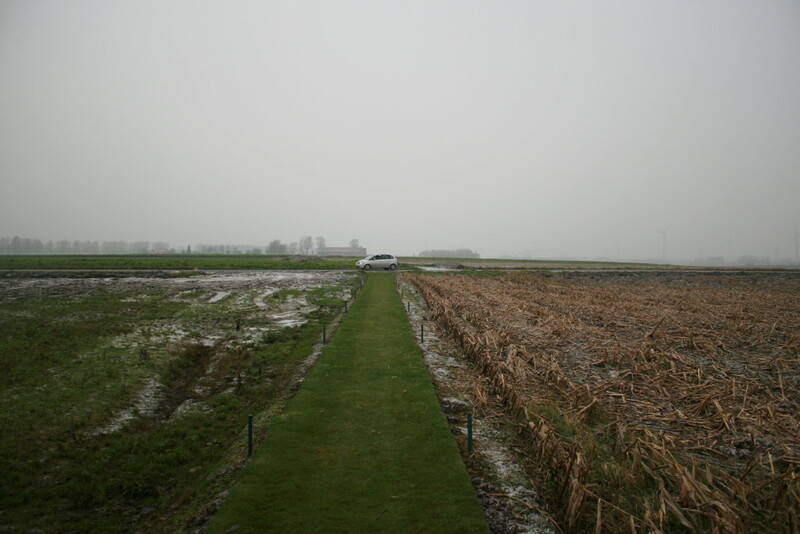 The distance between the opposing trenches at this point was little more than a hundred yards, and this view, taken from just in front of the British front line, looks east, towards the German lines. It’s always the strangest feeling, standing in a place that you know was once No Man’s Land. 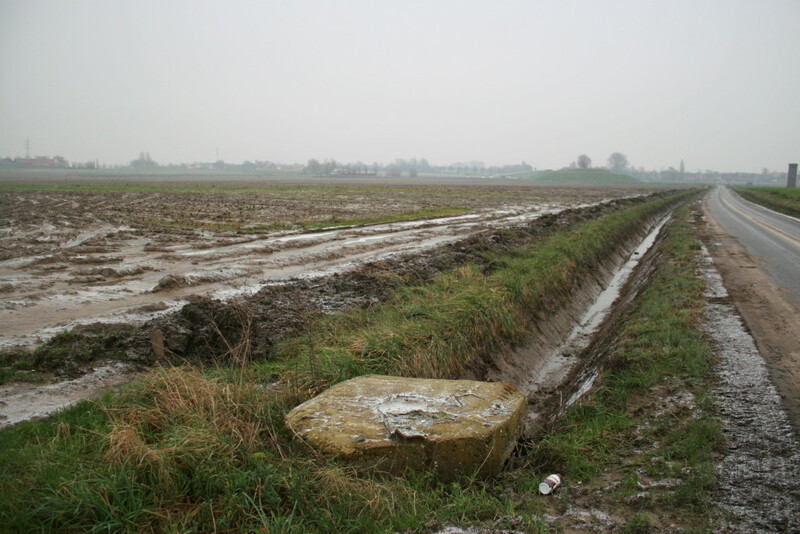 As the name implies, there was a time when no man could have stood where you are now standing and survived, and if that doesn’t send a shiver down your spine, then I don’t know what will. …inside which we find the Cemetery Register & Visitor’s Book. Should you visit any of the CWGC cemeteries along the Western Front, try to remember to sign the Visitor’s Book. 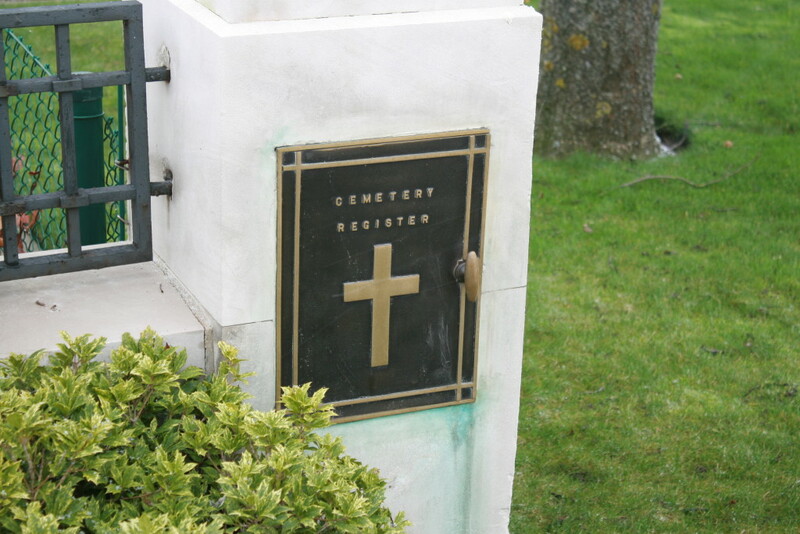 It’s useful information for the CWGC, and anyway, it’s interesting to see where, and how far, people have come from to visit, to read their often poignant comments, and to see how many, or sometimes how few, visitors there have been in recent times. 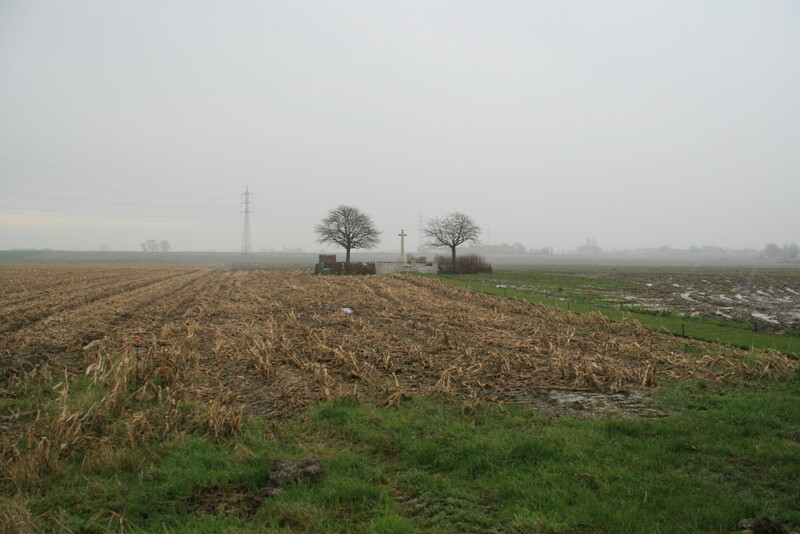 There are just 129 burials in this little cemetery, 27 of which are unidentified. 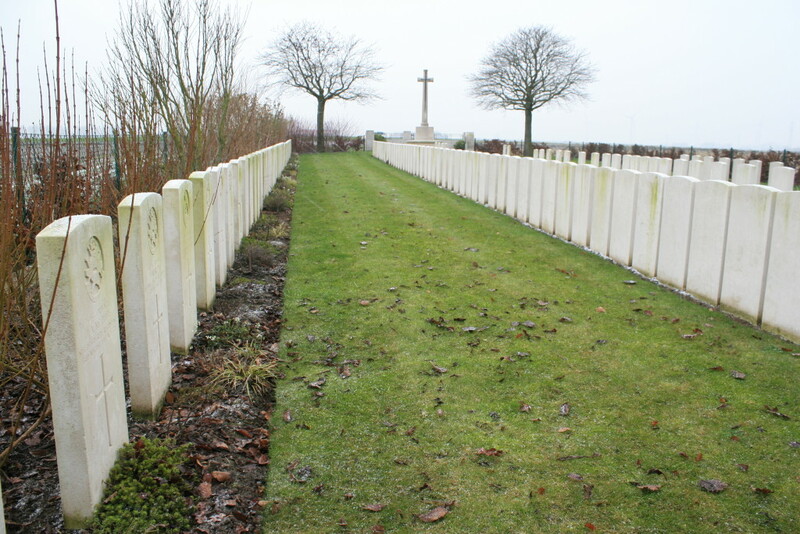 Of the other 102, 29 are men killed on 31st July 1917, all but four buried in Row E, to the right of the above picture. 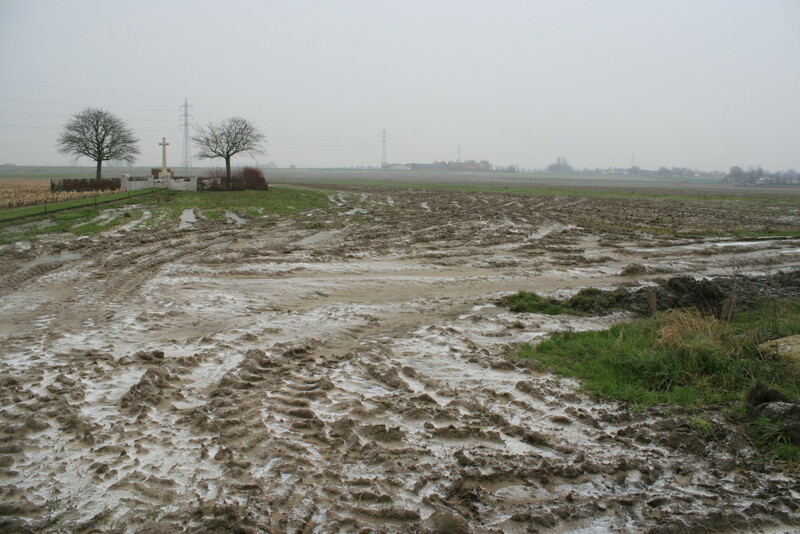 56 of the identified men buried here were killed during August 1917, and twenty during September as the fighting continued, after which, as the tide of battle moved slowly east, only a further thirteen burials were made here before the end of the year. 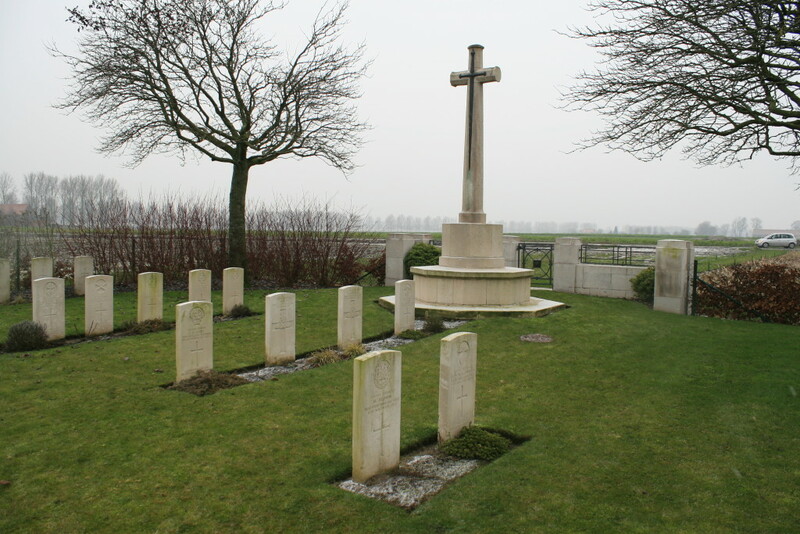 For reasons unknown, there are two Royal Irish Fusiliers graves here from May 1918, one in the front row above. Looking west down Row E, Row D to the right. 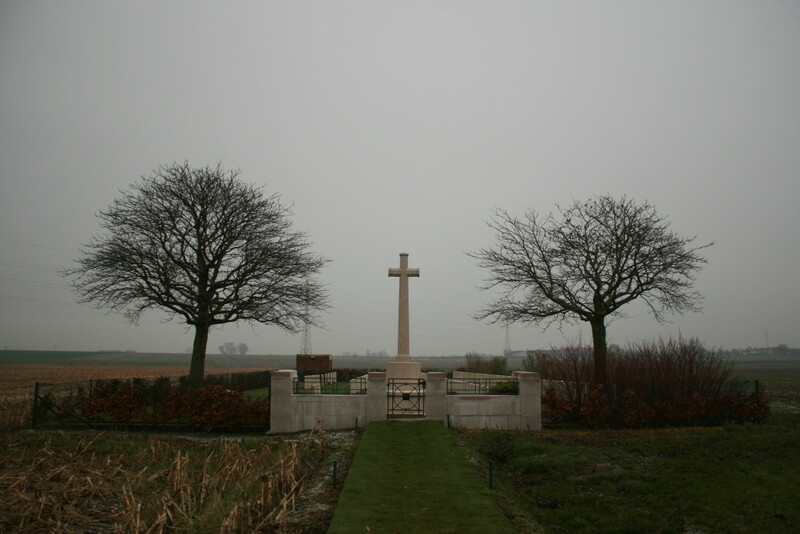 Two Sherwood Foresters, killed on 30th July 1917 and buried in Row E, are actually the earliest burials in the cemetery but, considering the site of the cemetery was in No Man’s Land at the time, they cannot have been buried until 1st August or even later, along with the men killed on 31st July. 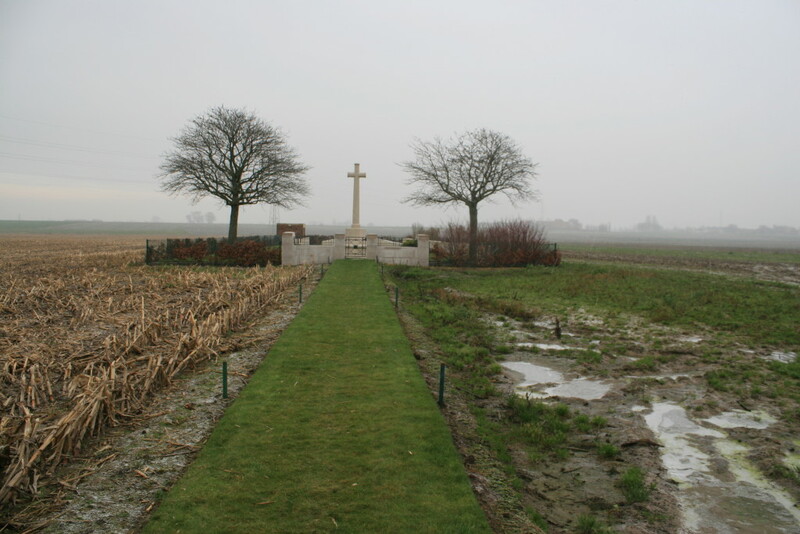 The four men killed on 31st July 1917 not buried in Row E are all to be found here, the first four identified graves at the start of Row D (foreground). 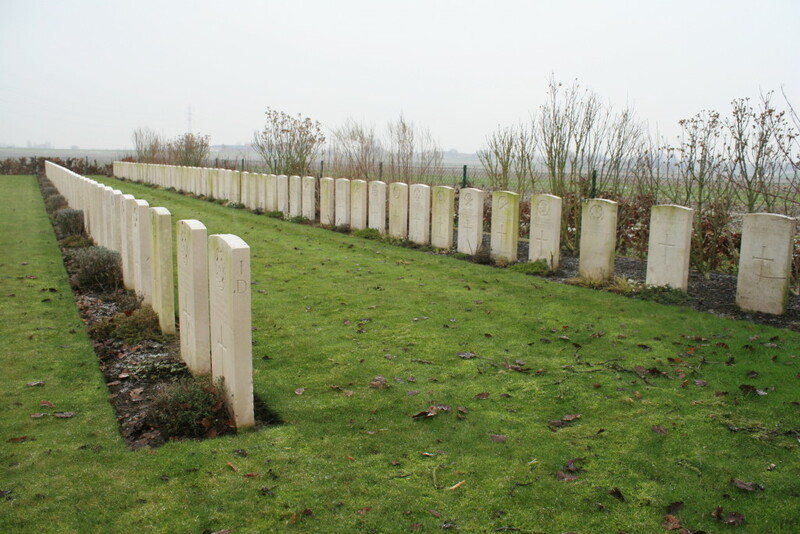 Along the northern cemetery boundary, Row A contains five identified burials, four of whom are Canadian privates who were all killed, presumably together, on 6th November 1917. 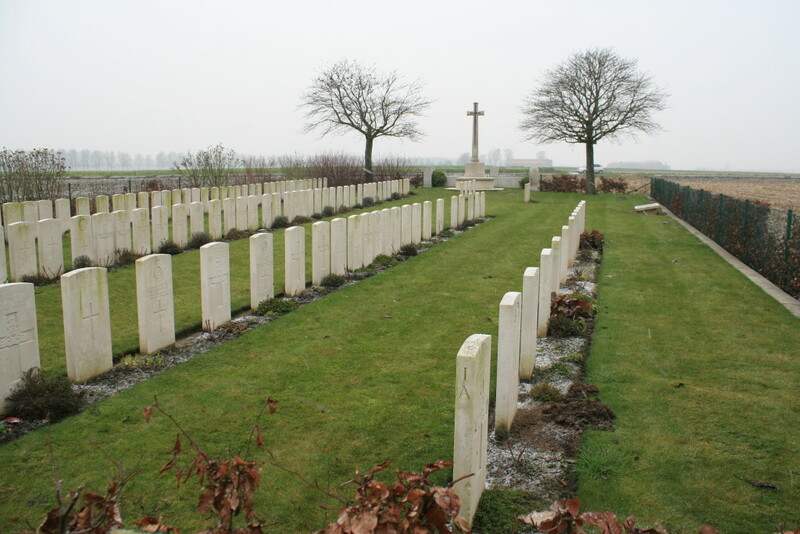 Apart from the two Royal Irish Fusiliers mentioned previously, these are among the final burials made here, the cemetery being closed down on 9th November 1917. …who were out in these conditions, day after day, night after night. 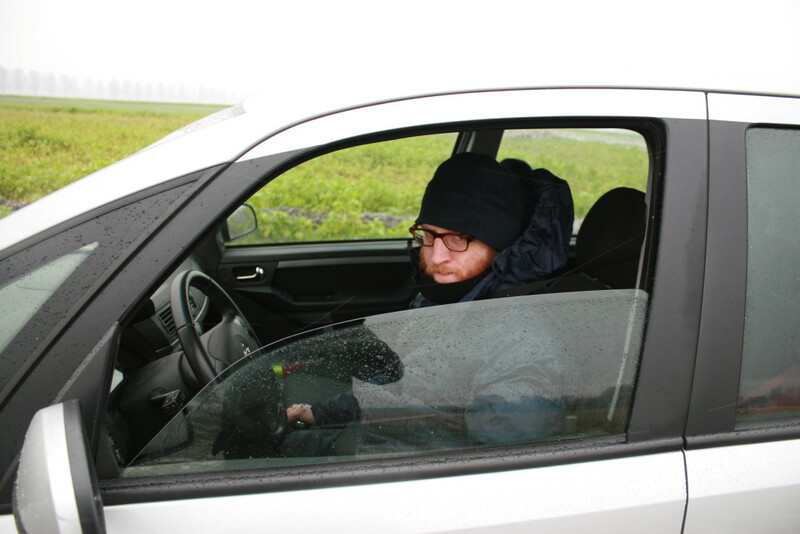 He doesn’t look a very happy bunny either, does he? And why should he? He knew we still had three more cemeteries to visit, weather permitting, on this freezing afternoon. 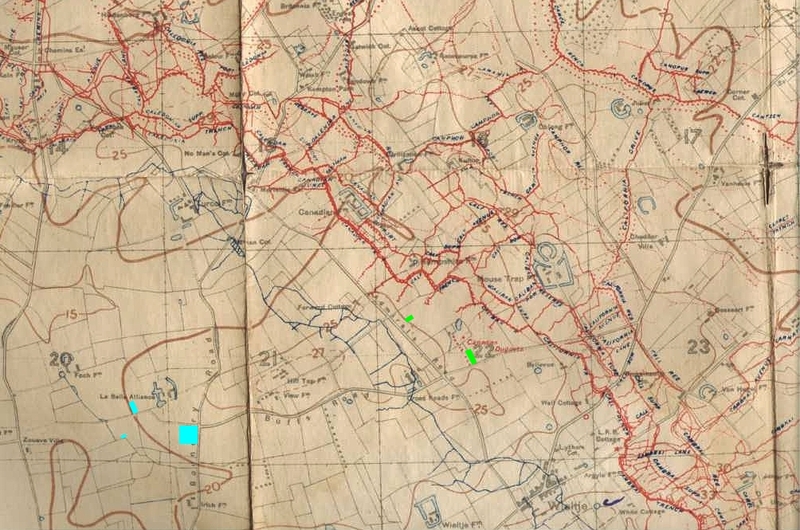 Before we continue, if you were to follow Buffs Road west on the above map, you would soon come across three cemeteries you may, or may not, remember we visited some time back: Divisional Collecting Post Cemetery & Extension , New Irish Farm Cemetery , and La Belle Alliance Cemetery, (all marked in blue. 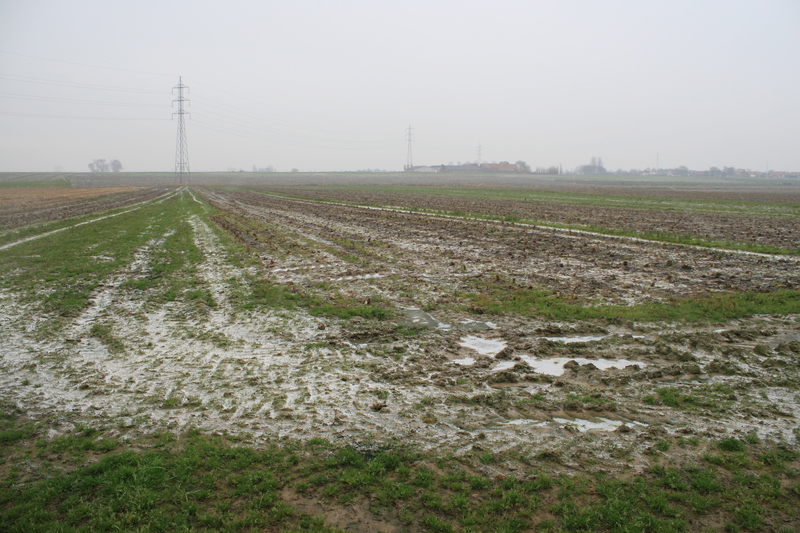 Click the Divisional Collecting Post link to continue the Road to Passchendaele tour). Otherwise, you can continue our afternoon excursion by clicking here. Hello. While I was doing some research into the Battle of Sanctuary Wood in June 1916, I found a site at McMaster University in Ontario, Canada that contains a wealth of trench maps and aerial photos from WW1. 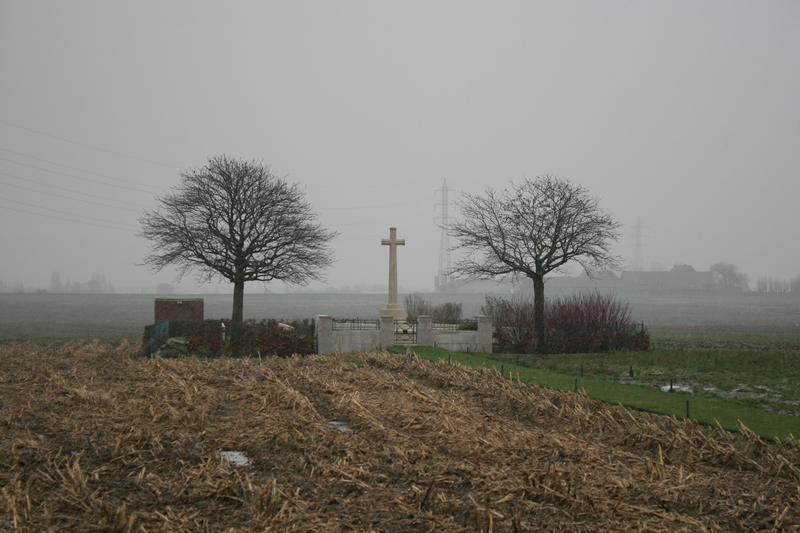 I learned how to read the coordinates on the trench maps and was able to pinpoint the original resting place of Pte. Farquhar McLennan, 58th Battalion, CEF, before he transferred to Bedford House. Then I managed to overlay a trench map from June, 1916 onto the Sanctuary Wood satellite photo in Google Earth. I don’t know if you have tried this but the results are amazing in terms of being able to where the trenches were, superimposed on today’s topography. 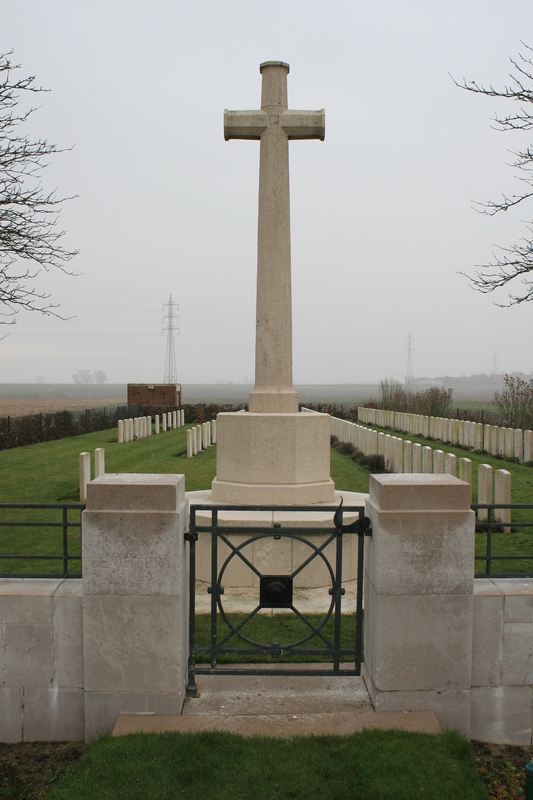 I was then able to mark the burial spot using the coordinates from the CWGC documents from Bedford House. Rick, you tell me all this just days (literally) after I’ve shelled out loadsamoney on the Linesman GPS trench-overlay software!! And I can’t make head nor tail of it at the moment!! In all seriousness, what you have managed to do sounds very cool to me (I am aware of the McMaster University site). I hope you’ve checked out the Sanctuary Wood/Hill 62 category on my site though; unfortunately I haven’t yet uploaded my photos of Sanctuary Wood Cemetery itself, with six inches of snow on the ground which I took last year, but they will be uploaded at some point later in the year. You’ll find Bedford House here too (use the Search box). Anyway, thanks for taking the trouble to post your comments. Much appreciated.